My Sunday mornings consist of basically the same 2 stops. First stop is Publix at 7:00am when they open. After I finish my grocery shopping, I travel to Whole Foods and arrive at 8:00am when they open. I pick up my things and journey back home. Sometimes, I eat breakfast before I go…sometimes after I go…and sometimes, I treat myself to a Sunday Morning Delight. Located in the ‘bakery’ section of Whole Foods, is an assortment of cookies, pastries, muffins and bagels. Every so often, when I feel like loving myself, I grab a Multi-Grain Bagel for a cool 99cents. My oh my, this is one lovely Sunday Morning Delight. When I first discovered the multi-grain bagel, I was in love. This bagel is pretty small as far as the typical American bagel goes but, it is really just the right size. Normally, the bagel is warm which makes it taste even better. I love the shape of the bagel – no two are alike and you really know this is one fresh bagel. The outside of the bagel is cooked just enough as is the inside. While the outside has a slight bit of a very mild crunch, the outside is ohh so soft and chewy. Chewy is really the best way to describe this. But not a bad chewy…it is totally a good chewy. 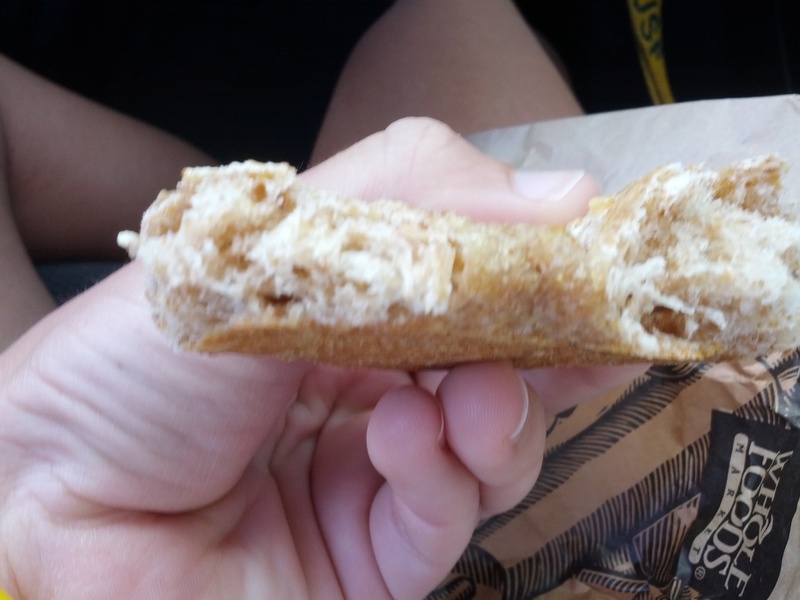 Every single bite is full of wheaty-grainy goodness. I love the pull this bagel has and one bite is just as good as the next. The inside of this is so soft…so soft…it is just magical. 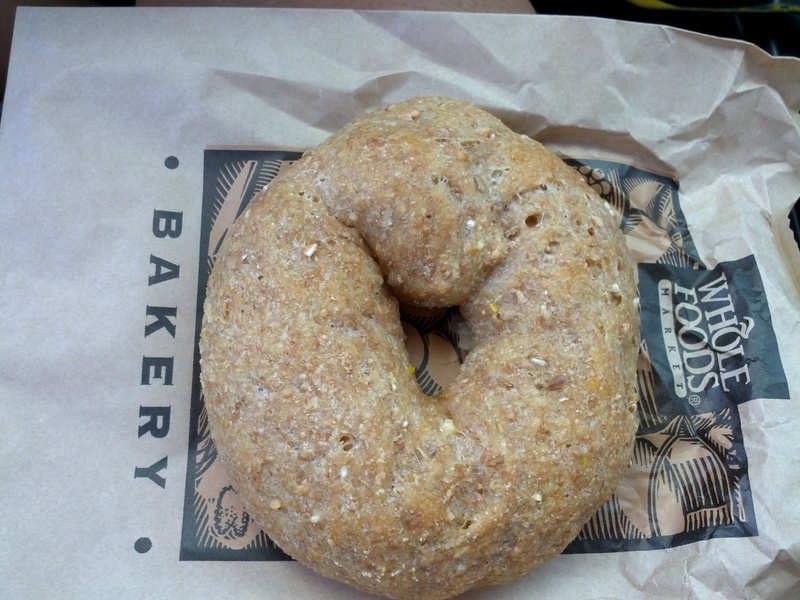 By far, this bagel is one of the best tasting multi-grain bagels I have ever had. Not only can you taste the grains but, you can also taste the freshness baked right in. Plus, that chew – ohh, I’m in love. I eat this bagel plain, with nothing on it – it is legit, that good. My Sunday morning may seem like a bore to you and you may be asking yourself why I go grocery shopping so early. Since I do not live in Cincinnati with Kroger’s and their singles nights, I prefer to hit up the store before it gets crowded. It gives me plenty of time to get all of my things and have some alone time. And, on those occasional Sunday mornings when I feel like treating myself right, I grab a Multi-Grain Bagel from Whole Foods. A simple combination of chewy & soft, tasty & decadent – it is simply my Sunday Morning Delight. Josh here from the BlinkPack blog. I adore bagels — just tried Marx Hot Bagels in Cincinnati, and it was phenomenal. I wish you all the best with your blogging. Cheers!